888. . . Eye Remember Hu ! 786….to Love. from Love. with Love…..knock and the door will be opened . seek and u shall find… my sufi journey started in 1996. in 1996 eye was blessed to travel to senegal west africa in search of a spiritual master/sufi cheikh. eye left for senegal with a one way ticket and a backpack. arriving in senegal eye did not know a soul. all eye had was the name of a contact person who was suppose to meet me at the airport with a sign that had my name on it “Qiyamah Abdallah.” eye spent 3 days at my host house before meeting my master. upon meeting my master, eye never saw my host again. Sufi has a BS degree in Biology from St. Augustine’s College and a MS degree from Indiana University in Secondary Education. He is a member of Omega Psi Phi fraternity and Prince Hall Masonic Lodge. Sufi is an initiate of more than one sufi order and system of Self Realization. 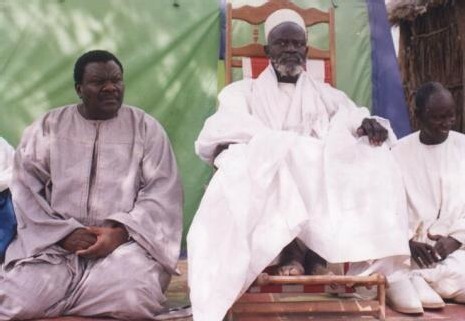 He is the first representative of his master, Serigne Saliou Mbacke-Cheikh Betcio Thioune, here in the west. He has traveled to Senegal west Africa 8 times, since 1996, to study the science of the inner path. He lived in Senegal for 2 years, from 2002-2004 , to complete his training on the mystic path. He has self published 8 books with more to come. He is the founder of the Cheikh Ahmadou Bamba Sufi School here in the west. He provides the services of: sufi initiation, spiritual guidance, story telling, talisman making, spiritual blessing, magic curse and spell breaking/removal, and house blessing and purification. He is available for lectures, story telling and workshops around the country and abroad.